They have a show coming up near me, at the Cow Palace in San Francisco and I know they do a lot of shows but I have never been to one. Generally, how are they? I can see they are heavy on autograph guests, they have a pretty heavy lineup of players like Ripken, Clark, most SF Giants, etc. i would love to get those autos but that's not what I'm going for, don't wanna spend hundreds for a couple of autos when I'm probably only going with around $200. I know other shows just focus on dealers and whoever else wants a table, do you think this show will have that feel too? I pretty much go to buy low end in bulk.. Old sets, cheap boxes, oddball stuff and any real cheap cards whether it's base, auto, etc. I will murder bargain bins.. I typically for $.10-$1.00 bins of they are available. For those who have attended their shows, do you think I will find such there? I know logistically it's probably a bit of a different show everywhere, but just a general idea... Or is it really just primarily based on autographers and authenticating? TriStar San Francisco usually has something for everyone. However, it is typically very heavy on Giants and prospects. 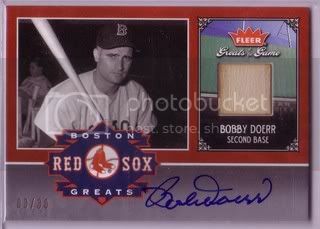 I'll be going to pick up some raw, low-grade 1951 Bowman for my set project, and to take some stuff to PSA/DNA. Tristar SF is the best show in the SF Bay area. I go every year. Lots of visitors from out of SF too. I don't bargain bin myself but if I set up i always do a cheapy box. The Houston show has some nice bargain bin stuff. That's all I go for save for the occasional autograph guest. I've been off and on collecting the past few years, but I'm excited for the upcoming Cow Palace show. 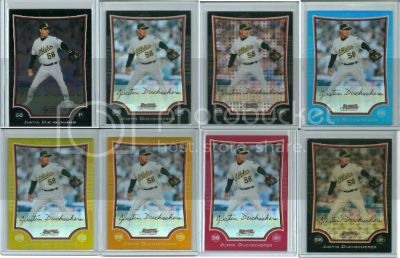 I'll be looking for prospects mostly, and maybe a couple boxes to ?rack. Anybody remember a few years back when they held it at another SF convention center a few miles away from the CP. I just remember that show was awful and had few tables. It's usually pretty good, though there is a good amount of vintage (which I like but isn't everyone's thing), and high-end. As a low/mid end collector, I generally don't do great, but find a few things. If I remember correctly, there are some guys who turn up with bulk boxes. Worth an hour or two, not more. Let's clarify that - it's worth an hour or two if you're a prospector, but if you look at everything else, then it's worth the time. I have blocked out that entire weekend for the show, and I hope to pick up some cards and sell some cards. I got some pc cards and also picked up some wants! I also sold some cards. Pretty good day! Was gonna go today but I wouldn'tve got there till 5 and I don't wanna feel rushed.. I might only need a couple hours but will feel better knowing I have as much time as I want/need. Only shows I've been to are a GTSM (is that right?) show late last year and the show at the mall here. So this will be my first big show, hopin to find lots of stuff.. Sure i will. Shout out to Ice Cube, cause today was a good day.